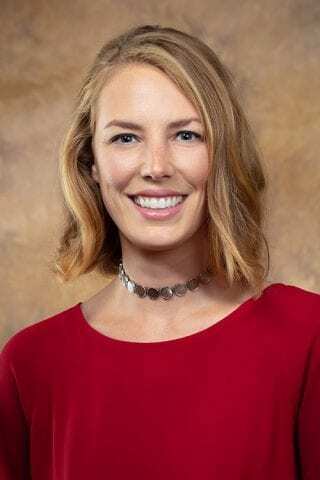 Christine Holyfield, a University of Arkansas assistant professor of communication disorders, has received a New Investigators Research Grant from the American Speech-Language-Hearing Foundation. She will compare assisted communication device features in relation to how quickly children with intellectual and developmental disabilities learn to use them. Augmentative and alternative communication devices often use photos or icons as representations of words the child is learning to say and understand. If children have to first learn what the icon or symbol is, it may be more beneficial to use the actual word spelled out instead, Holyfield said. Holyfield will work with students in area elementary schools to collect data. The grant funding covers one year. She will be honored at the American Speech-Language-Hearing Association national conference in November in Boston. Holyfield joined the faculty of the College of Education and Health Professions last fall. The New Investigators Research Grants are awarded to researchers who earned a doctorate within the past five years. Holyfield completed a completed a doctorate in communication sciences and disorders at Pennsylvania State University.